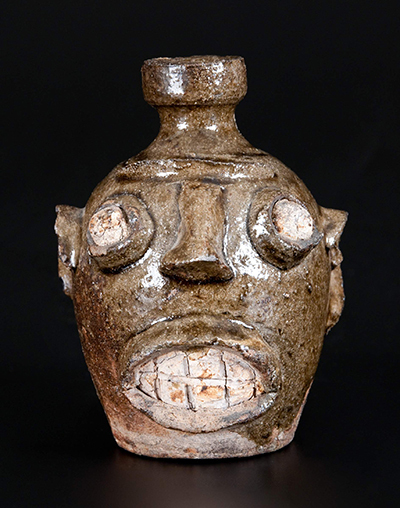 Rare alkaline-glazed stoneware face jug with kaolin eyes and teeth, Edgefield, S.C., circa 1860, sold for $92,000. Zipp told Antiques and the Arts Weekly that the lady who consigned the piece had briefly posted it on eBay after purchasing it at a local yard sale in New Jersey. Overwhelmed by many aggressive offers from interested buyers on the online platform, she withdrew it and sought out Crocker Farm for advice. Zipp and his son Luke drove up to see it and immediately recognized it as an important and desirable slave-made ceramic vessel. The firm has handled many face jugs, which are both folky and expressive, but this example was a tour de force despite its diminutive size at 5 inches tall. Taking it to the heights of expressive form were its kaolin eyes and teeth. The eyes rattle freely within their sockets, thanks to the maker’s resist technique of applying beeswax, leaving them unglazed during the firing. The consignor was in the gallery during the sale, and was “thrilled,” said Luke Zipp. New York State collector Adam Weitsman successfully bid on this rare 4-gallon stoneware jar with a large cobalt elephant decoration, stamped “West Troy/ N.Y./Pottery,” circa 1880, which realized $166,750. 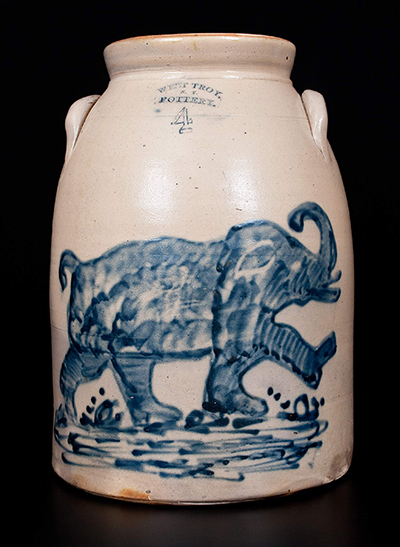 The top lot in the sale also represented a pinnacle of American folk art — a rare 4-gallon stoneware jar decorated with a large cobalt stampeding elephant, stamped “West Troy/N.Y./Pottery,” circa 1880, brought $166,750 from well-known collector Adam Weitsman bidding on the phone. It will be included in his forthcoming book about his collection, which he regularly donates to the New York State Museum. “I had never before seen a design of this caliber and it fills out a nice space in my collection. The fact that it’s a West Troy piece makes it even nicer,” said Weitsman. A complete report on this sale will follow.